19:50 - After an impressive performance. Biggie announces that housemates have won their 100% wager! He congratulates them on their win and tells them that the storeroom is now open. 19:00 - Task presentation starts. 18:40 - 20 minutes to task presentation. 17:35 - Housemates rehearse for their task performance this evening. 17:10 - Goitse is put for eviction next week for cheating during the freeze task. 17:05 - Permithias explains himself to Butterphly. Butterphly tells him to Africanize his accent so that she can understand what he is saying. 16:20 - It's meal time in the house. 15:50 - Tayo tells Biggie that he feels better today than yesterday and he enjoys the freeze task. 15:44 - Trezagah is enjoying this comedy week. He mentions that he had not realized that he was good at comedy. 15:30 - Nhlanhla says everyone's a bit wary about the task. 15:25 - Butterphly feels Trezagah has come out of his shell this week. 15:14 - Ellah in the diary room flirts with Biggie. Biggie freezes her and she tells him that he makes her blush. 14:50 - Frankie is enjoying every single moment of this comedy week. He says the funniest thing is that people have accepted to be funny. He talks about Trezagah being quiet but he is now cracking their ribs. He says that the housemates are very cooperative and they're throwing ideas to each other. He feels its a good thing that Biggie draws them out of their comfort zone. 14:42 - Idris talks about comedy week saying he never imagined that people would be so funny. He says his sense of humor is out of sense. He says housemates understand how important it is to win the wager because it helps everyone and he feels they have 90% chances of winning this week's wager. He begs Africa to vote for Butterphly because he didn't add her to leave but to help her know where she stands in the game. 14:31 - Samantha is not convinced they will win the wager as they are not consistent. According to her the biggest challenge is that they are confused with the song. She says the only relationships in the house she's aware of are Nhlanhla and Sheillah plus Sipe and Macky2. That hers with Idris and JJ, they are just friends. She says that Idris is a good friend as she can be herself with him and she would want to have the same with JJ but he does so many things seeking attention and also says things he doesnt think about. She adds that she doesnt want to hurt JJ. 13:58 - Sheillah is not pleased that people throw her ideas but she's hopeful they'll make it and win the wager. She talks about Idris, JJ and Nhlanhla as naturally funny people and they're making them laugh. She feels Trezagah is being open as he was realising the nomination blues. That her top 3 are: Tayo, Macky2 and herself. 13:44 - Mr. 265 says that today is a special day, it's his mom's birthday and he's wearing a special attire. He says they are going to sing for her and he is going to cook tonight. His message to his mom is that she should carry on being the strong person she is and she's the biggest factor for his life. He feels the energy in the house is gone up and everybody seems to be very excited. 13:35 - M'am Bea mentions that her sense of humor is random, she doesn't have to think so hard. What she enjoys most in the house is the lovely furniture, the bedrooms and the names for the bedrooms, the romance in the house and sometimes the arguments. Idris makes her laugh. She says she's planning to invite Biggie for dinner and ask him some questions like his first name. Big Brother promises her a dinner next week. 13:30 - JJ tells Biggie that Idris is really funny and finds a way to make situations lighter. That they sorted out their differences with Idris as brothers and now they're cool. He feels close to Samantha because they have been talking for some good time. He says Idris' relationship with Samantha doesn't affect his relationship with either Idris or Samantha as he is like a little brother to them. He promises that Biggie and Africa will love their performance tonight. 13:20 - Goitse says she has recovered from yesterday's trauma and she's ready for anything today as the boss and she's gonna show them what the boss can do. Her lightest moment so far is during their skits, Trezagah made her laugh. She adds that her sense of humor is a dry one. She feels at the moment living in the house is crazy, the monsters are haunting her. She thinks they will win the wager and she cant wait for the presentation. 13:12 - Permithias has profiled his fellow housemates and he reads out what he's written so far. According to him, JJ knows a lot and prefers to lie to himself, Samantha is the master manipulator, too analytical and will watch you crumble, M'am Bea acts all holy but far from it, Frankie has fear of being open to new things and likes his comfort zone, Idris uses his comedy to fool you but knows what he is going for and will take no prisoners, Tayo is loud and uses other people's weaknesses against them to massage his ego, Mr. 265 has esteem issues and is a master manipulator, Macky2 is quiet but powerful within his own zone while Trezagah desperate for show time. He has also composed an anthem for the world and he reads it out to Africa. 12:59 - Diary sessions start: Macky2 describes himself as one with a great sense of humor though he is not funny and is bad at cracking jokes. He says today they've come up with their comedy musical song and he's hopeful they will win the wager. 12:23 - Sheillah says that when it comes to picking men, she would get a trophy and beat her chest because she's good at it, Tayo and M'am Bea chuckle. 12:00 - Each housemate will be required to come up with a few lyrical lines as part of the presentation. 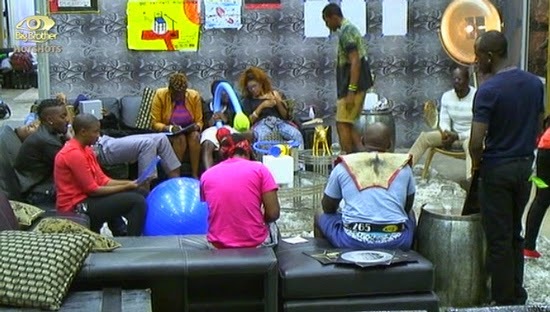 Trezagah's lines impress many "He got friends: Mr.265, Macky2, Tayo and Frankie all they talk about is booze.."
11:45 - Housemates gather in the lounge and rehearse ahead of tonight's task presentation. 11:25 - Biggie tells Housemates go indoors and remain there until further notice. 11:00 - Macky2 and Sipe have some time together outside, they chat about their time in the house so far. They also talk about trust. 10:50 - Permithias and Tayo play soccer on the lawn. 10:39 - Housemates take naps, Trezagah leads the pack. 10:05 - Frankie shares with Permithias and Mr. 265 that initially he thought and told Sheillah that he personality was bitchy but after sitting down with her and they'd a talk, he realized that she was a different person. 10:02 - Biggie says hot water is no longer available. Permithias almost freezes thinking it's yet another freeze task. 09:40 - "Boys will always be boys," Mr. 265 tells Frankie. 09:38 - Nhlanhla and Sheillah have breakfast, Permithias won’t leave the kitchen. 09:30 - Tayo joins the singing or is it shouting and sings Haitian hip hop recording artist Wyclef Jean's Two Wrongs, Goitse backs him up. 09:25 - Goitse showers as she sings on top of her voice, Idris playfully tells her to stop shouting. 09:20 - Ma'm Bea does Idris' hair. 09:09 - "Burn those eggs until they change color," Ellah tells Permithias who is busy in the kitchen. 09:07 - JJ and Goitse hug in the kitchen area, seemed liked eternity as the pair stayed glued in each others chest for a while. 09:03 - Hot water is availed, shower house starts. 09:00 - Frankie helps Samantha workout in the garden, Butterphly joins in a little later as ‘bearded’ Mr.265 plays commentator. 08:55 - Fabian's session ends as he exits the house. Housemates get ready for the day ahead. Permithias and Ellah are in the kitchen preparing breakfast. 08:25 - Nigerian actor Fabian Lojede popular for his role in drama series 'Jacob's Cross' is today's guest, he takes housemates through various acting stints to help them come up with their own scripts.